What hasn't been written about xiaolongbao, the humble Shanghainese soup dumpling? It is a marvel of engineering; skin thin enough to be translucent, pleated around seasoned pork and bursting at the seams with umami-rich soup. Further enhanced with a dip in black vinegar and topped with thin slivers of ginger, it is consumed by daintily lifting by the top where the skin is thickest and raising to your lips in a soup spoon, lest any spillage occurs during consumption. Living in Shanghai, the birthplace of xiaolongbao, I'm spoiled to be able to indulge in a basket whenever the craving strikes. And it happens more often than I'd like to admit. Locals believe that a good xiaolongbao is in the ratio of skin, soup and meat. The thinner the skin and more plentiful the soup and meat, the better. But the perfect xiaolongbao is often elusive, a product of the nimble hands of young chefs who roll and pleat behind kitchen glass, affected by the immediacy with which you consume them after steaming,and perhaps also the amount of hunger and anticipation involved.At most mom and pop stalls in Shanghai, no two baskets taste exactly the same due to these and other variables. And although not necessarily the very best, the places that have mastered consistency of taste, flavor and texture are mega chains like Din Tai Fung and Paradise Dynasty, which is how we are able to enjoy them in their pure form as far away as Melbourne and Toronto. Of course, a xiaolongbao is not just a feat of engineering. There is a bit of magic to it as well. That's where the house recipes shines, the quality of the dough, the seasoning of the meat and aspic with any variation of shaoxing wine, sugar, ginger, and spring onion. This is where subjectivity come in, and why a scientific examination of xiaolongbao can only take you that far. The following are, in no particular order, a few of the best xiaolongbao restaurants in Shanghai, determined after more than four years of senseless gorging, countless baskets consumed, zero scientific measurements, and based completely on my own taste preferences. You'll recall some of these on my first list made several years ago, there are a few new additions. For each of my selections, I have included its ranking on Christopher St. Cavish's Xiaolongbao Index and its corresponding data set. First of all let’s talk about DTF, it is a global chain but cannot be knocked for that simply because of its remarkable accomplishment in standardization, efficiency and consistency. Founded in 1972 by a husband and wife team, it burst onto the global scene in the early 90s when it caught the attention of Japanese department store Takashimaya, which helped it apply standardization practices and expand across Japan. But it was really put on the map by famed chef and godfather of Chinese food Ken Hom when he wrote lauded DTF in an article for NYTimes that named it one of the "top 10 restaurants in the world" (! ), hype that they have managed to ride until today. Later, with the development of an enormous central kitchen in Taiwan and standardizing its menu, DTF was able to expand even quicker to more than four dozen restaurants in China, Japan, Hong Kong, Singapore, Korea, Indonesia, Malaysia, Australia, and the United States. If you live outside of Shanghai, this is probably your best bet to getting a taste of a truly good xiaolongbao. The skin is thin, and each bao has at least 18 pleats every time. You can get original pork flavor, pork with crab roe, shrimp, etc. The combination of complete standardization and a rigorous training program for staff ensures the same delicious bite every single time. Yes, another large chain. This restaurant group started in Singapore and has since expanded to China, Malaysia, Indonesia, Japan and Hong Kong. 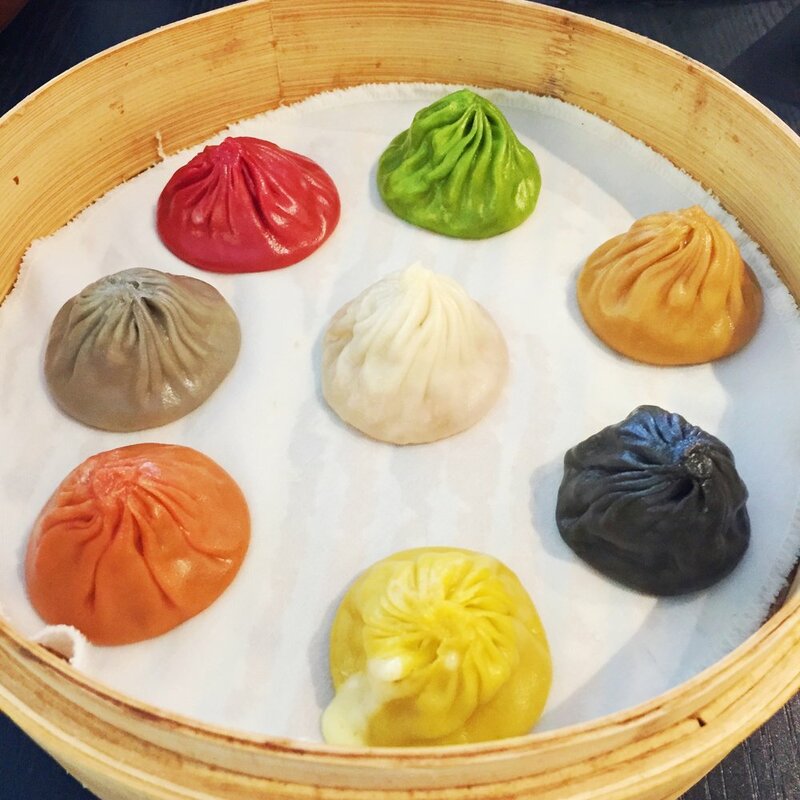 These guys also serve a consistently great xiaolongbao, but the attraction here is "the world's first fusion baos", with innovative flavors like ginseng, cheese, crab roe, garlic, loofah, Sichuan mala, foie gras and black truffle. I held out on trying these for a long time, thinking they were a bit too gimmicky, but when I finally gave in for the sake of research, I found them thoroughly enjoyable. Each of the flavors distinctly taste as they should, but don't overwhelm the taste of the actual pork. The skin is thin and are colored with what the restaurant claims are natural vegetable juices. I couldn't even pick a favorite. Now we get into some more "local" restaurants, although these are still chains in China. For some background, the xiaolongbao can be broken down regionally, with Nanjing, Shanghai and Suzhou/Wuxi being the dominant styles. They were originally invented in the neighboring town of Nanxiang, and tourists still flock to places like Nanxiang Xiaolong in Shanghai's Old Town for a taste of the traditional version which has thicker skin and less soup. There's also the Suzhou/Wuxi style with its sweeter filling and larger dumpling. But its the Nanjing Style, smaller, almost translucent skin with less meat that has become the preferred style of modern Shanghainese according to their votes on Chinese restaurant ratings site Dianping. Of this style, Jia Jia is the most well-known in Shanghai, and has perfected this in its delicate wrapper and well-seasoned meat and soup. The hoards of people in line at its Huanghe Road location every day would agree. I lauded this place four years ago and still maintain its one of the best. From the same owners as Jia Jia, this one is superior because it's less known and therefore less hectic. The product is pretty much exactly the same. The original location on a chill stretch of Jianguo Lu with a great old Shanghai vibe has done remarkably well, with over 2000 votes on Dianping giving it an 8.5/10 for flavor (no easy feat). They have now opened three additional ones, but I stick to the original. My order is always the same, a basket of crab roe and pork xiaolongbao, a bowl of scallion oil noodles (one of the best I’ve had), and an egg drop seaweed soup (pretty bland but nice to balance the other flavors with). Despite the baos not always looking like a million bucks (those girls in the kitchen aren't as whipped to shape as the masters at DTF), the flavor is always superlative. This one is maybe the most interesting newcomer on the scene. Holy Cow is actually a hot pot restaurant, a great one at that. Full disclosure: Anthony Zhao the owner and chef is a personal friend and I would follow him anywhere. He is kind of a celebrity in the Shanghai food scene, and is behind a super successful home-style Shanghainese lunch box restaurant called MiXiangYuan and just recently opened this coyly named hot pot place focused on fresh beef and organic veggies from his own farm. Where does the xiaolongbao come in you ask? Well he has invented (I claim- as I've never seen this done anywhere else) dunking xiaolongbao into hot pot. The skin is a bit thicker from the boiling rather than steaming, and gets infused with his intensely flavorful mushroom broth, adding another dimension to the xiaolongbao. Highly recommended. You're probably wondering how the top scorer on St. Cavish's Xiaolongbao Index stacks up against the rest. At a whopping score of 24.32 it stands far ahead of its nearest competitor and seems to have an impossibly thin skin at average 70mm holding up an impressive amount of soup and filling. Zun Ke Lai is also a chain with three locations in Shanghai, but this one is the closest to the city centre in the Xujiahui Indoor Stadium on Line 1. Plaques on display in the restaurant suggest it has won several awards for its xiaolongbao, particularly the crab roe and pork variety. They were out of crab roe on my last visit, so I could only try the original, but it didn't disappoint. It really was the thinnest skin I'd ever seen, and held up remarkably well with its heavy contents. The soup and filling were umami rich and full of flavor, not the thin, msg-laden type. Its impressive how good these were, considering the place is actually more known for its house yellow croaker noodles. I'll have to go back for those. But you can't talk about xiaolongbao in Shanghai without mentioning its cousin the shenjianbao, a tougher version with thick, bread-like skin that is shallow fried in a large cast iron pan, giving it a golden crispy bottom and finished with a dash of spring onion and sesame seeds. These are much larger, with mounds of pork inside and are similarly filled with scalding soup, making it even more tricky to eat than xiaolongbao. As usual, follow the protocol of biting a hole in it first while in a soup spoon, then I like to pour a bit of vinegar into and around the bun and slowly make your way through. Trying to attempt in one bite will result in dire consequences for your tongue, face and shirt. One of the best places to get them is Xiao Yang Fried Dumplings, it is considered the golden standard of shenjianbao in the city and has become so popular since opening in 1994 that it has since grown to 55 locations. Its hot pink signboard is literally everywhere. It is also remarkably consistent, the dumpling cooks are efficient, churning out dozens of dumplings every five minutes. The lines may be long, especially at the Huanghe Road location across from Jia Jia, but it moves fast and you'll always be getting the baos fresh off the pan. They've recently introduced shrimp shenjianbao, which are a fine specimen as well, filled to the brim with juicy shrimp meat and flowing with pork juices. As with the xiaolongbao, enjoy with a liberal dash of black vinegar.